No smartwatch has captured imaginations like the Moto 360. It's been the most eagerly awaited device to land in the Wareable office for review, and its popularity is such that it's been sold out online since the day it launched. While the Apple Watch came with the expectation and hype of any launch, its mystery was its appeal. 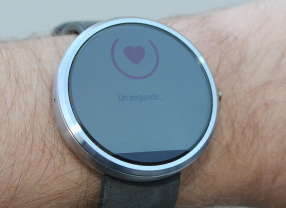 The Moto 360 on the other hand was teased back in March 2014, a full six months before its release and its circular display instantly made it a poster boy for Android Wear – Google's smartwatch OS. Now that the Moto 360 is upon us, does its delivery live up to the hype? Does it look as good in the flesh as it does in the pictures, and can it cope with the longevity of a full day in our busy lives? Read on to find out. First impressions count and unfortunately for Motorola, those teaser pictures live long in the memory. The Moto 360 is a lot chunkier than we hoped, measuring around 1cm deep on your wrist. It's an unpleasant shock at first, and one of a line of niggling problems that we're sure will improve as Moto iterates its hardware. It's a reminder that the Moto 360 suffers from the same issues as its peers: that this is first generation tech, and there's still a lot to get right. 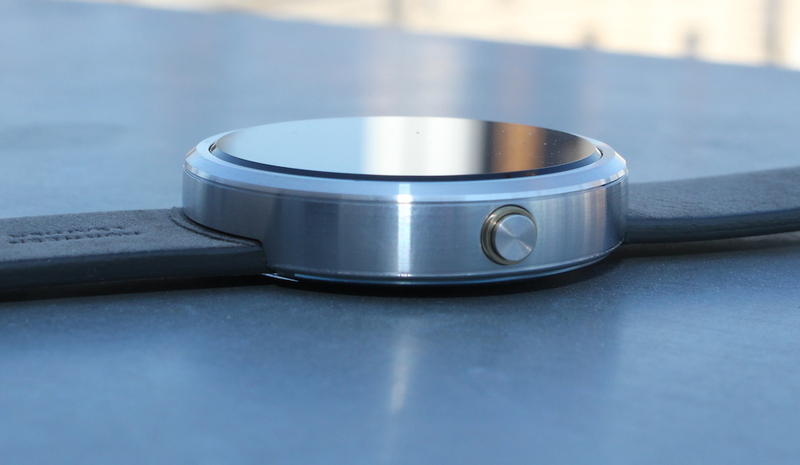 Once you've got over that nasty shock, you can start appreciating the Moto 360 for what it is. Sure, it's chunkier than we'd hoped, but once that initial disappointment subsides, it's actually a very sleek looking watch. And that's the key word: other Android watches have succeeded in becoming half-decent devices, but the Moto 360 succeeds in being able to be defined as a watch. There are two options: stainless steel – which we tried and preferred – or black, which looks extremely bland. The stainless steel case is well machined and its single unibody build is devoid of unsightly lines. Even the button on the right-hand-side is a nice homage the traditional wristwatch, even though it serves no real useful purpose, except to illuminate the screen, which you can do by tapping anyway. 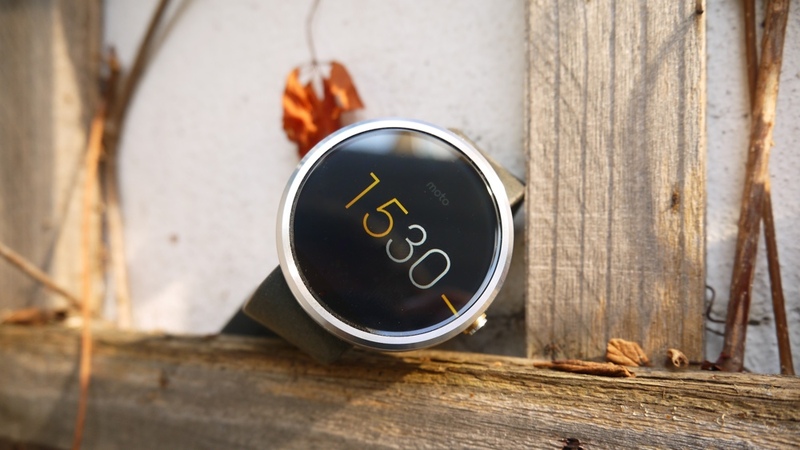 The Moto 360 catches admiring glances thanks to those lovely clean lines and the thin bezel. 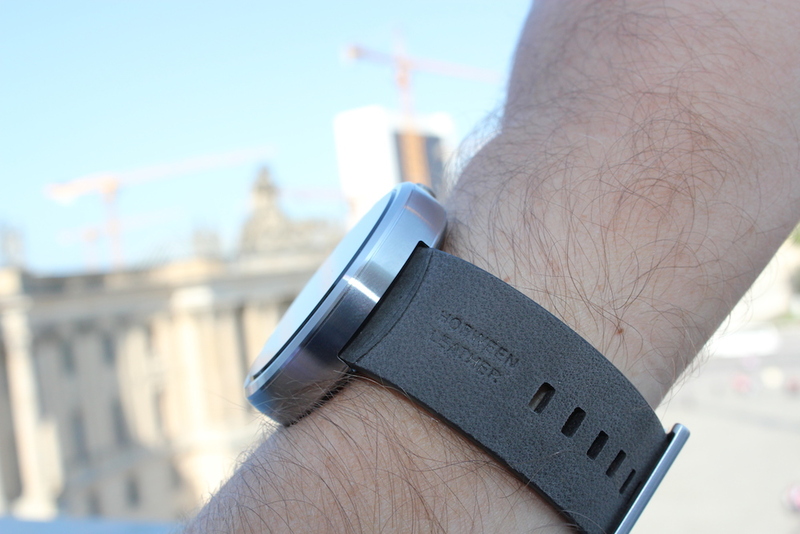 The Moto 360 comes with a leather strap, which comes in a muted grey or black. 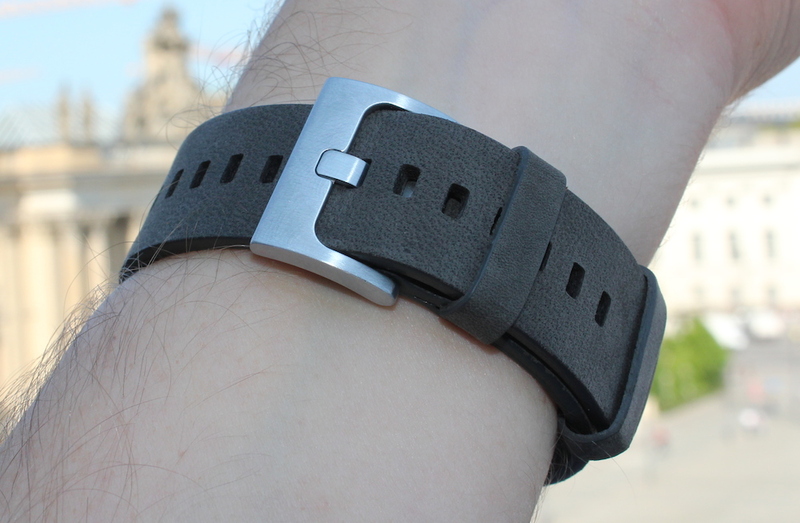 It's made of Horween leather, but it certainly isn't the best looking strap in the watch world. It's got precious little detailing or finesse, and purchasing a new one would be an essential upgrade for any self-respecting watch wearer. That would improve the overall look immensely, yet it's disappointing that Motorola couldn't provide a chicer starting point. Luckily, the strap is replaceable for anyone with a modicum of skill (or a professional), so you can choose something more to your taste. 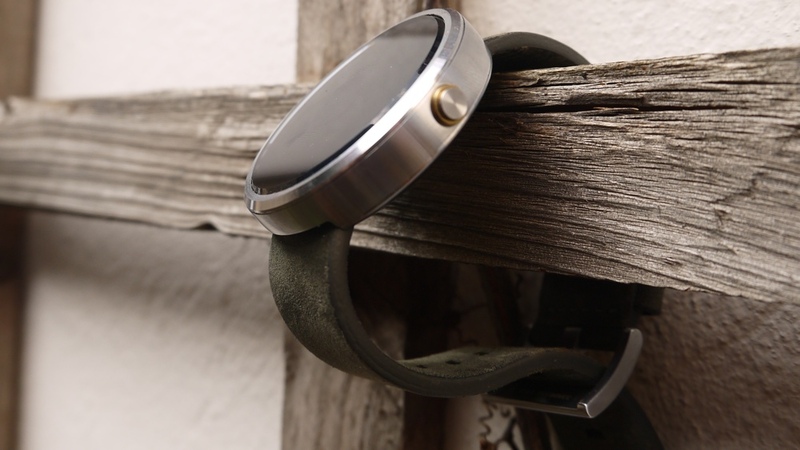 Check out this video to find out how to change the Moto 360 strap yourself. The circular display is something of a first in the smartwatch era, and had it not been for the LG G Watch R coming to upstage the Moto 360, we could have forgiven it some of its foibles. We'll start with the positives. There's almost no bezel to be found on the 360's face, and that really helps the overall look. It maximises the room, and helps define the 360 as a watch, rather than a gadget. However, when you start to consider the 360 as a gadget, things start to look less convincing. The first problem is the lack of AMOLED. All the leading watches use the brighter, sharper and more power efficient display, but the Moto uses a standard LCD. The result is a display that's noticeably grainier than the likes of the Samsung Gear Live and the LG G Watch R.
The problem isn't that the screen looks bad in itself. It's perfectly fine. However, if the pinnacle of this form factor is a screen so bright and crisp that a casual observer might actually mistake it for a real watch, this falls some way short. The final disappointment is the “flat tyre", or the black strip at the bottom of the display that encroaches into the screen. It's actually the ambient light sensor, a unique feature of the Moto 360, which dims or brightens the screen based on the light level around you. While it's a good concept, the flat spot ruins the overall screen experience, and couple that with the battery implications that we'll outline later, it seems a bizarre decision to include it – or at least implement it in this way. To save battery the Moto 360's display is off most of the time, and automatically turns on to reveal the clock face as you look at the screen – well, that's the idea. To be certain of getting your horological fix requires an exaggerated and theatrical time-checking movement to illuminate the screen, and we often found ourselves having to tap the screen just to check the time. Turning on the ambient light sensor does make the screen stay illuminated, yet it's often blindingly bright and the extra time it's on decimates battery life. 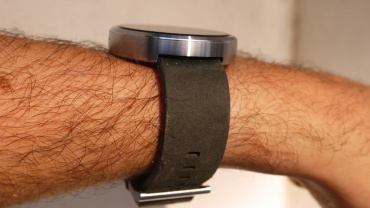 This undermines the basic premise of the Moto 360 as a watch – and it's not something hardware related. Motorola needs to improve the movement sensing for a better experience, and we hope that can be addressed through the firmware. 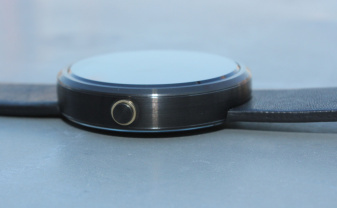 There are a number of features built into the Moto 360, most of which are health features. 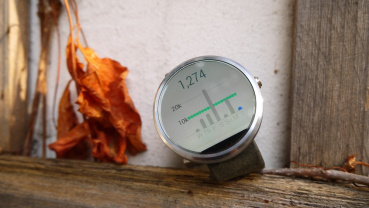 Google Fit keeps track of your step goals and heart rates, Heart Activity sets you a target of 30 minutes moderate activity a day and tracks your progress and Google Keep enables you to make notes using your voice. Voice recognition is generally good, but as soon as you're in a moderately noisy environment, the whole process falls apart. What's more, if you're replying to messages with your voice there's no opportunity to verify the content. We didn't manage one message that made sense. 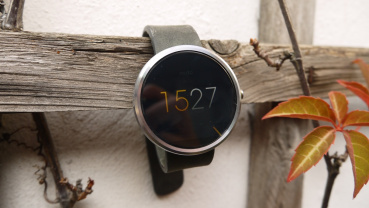 Being a fully paid up member of the Android Wear club, the Moto 360's feature list is nearly identical to its peers. For more information on Android Wear, its features and shortcomings, check out our comprehensive guide. Its main job – other than being a watch, of course – is to act as a partner to your smartphone, offering an array of notifications and handy shortcuts. If you get a call, text, email Whatsapp message, Facebook invite, calendar reminder or even app update, Android Wear will tell you about it. It's a great way to stay on top of things without having your head buried in your phone, and the Moto 360 is adept at it. Most of the time the next logical step is pulling your phone out to deal with it, but that's the limitation of the smartwatch form for now. The second main feature is putting Google Now in front of your eyeballs more easily. Google Now displays useful information from the web from train times, weather, football scores and even directions. It's not a well-polished service as yet, but it points to amazing things. 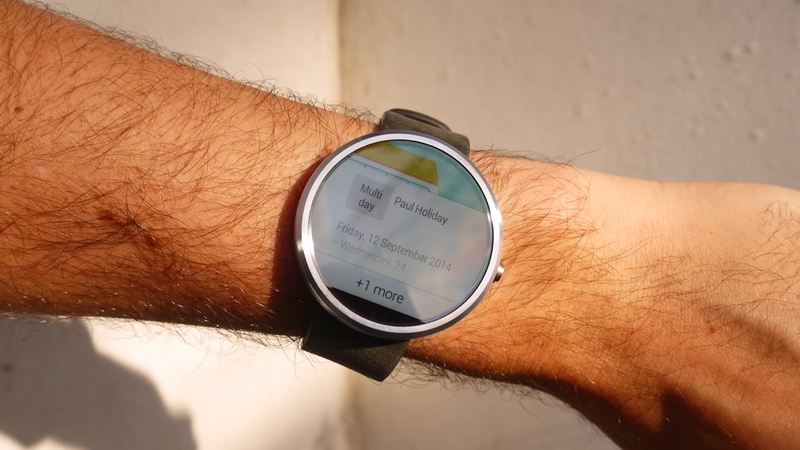 Again, read our comprehensive guide to Android Wear for more information. The third and final main feature is as a shortcut to your apps. Through a slightly laborious process (which is infinitely more appealing than talking to your watch) you can access apps such as Runkeeper, and have your stats appear on your watch as you run. There are a host of apps available on Google Play for Android Wear, and the number is growing daily. 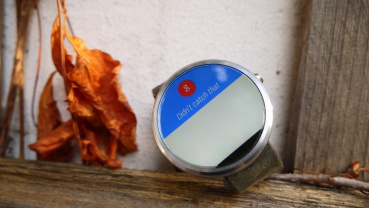 There are still problems with Android Wear that Google has to iron out. Getting the right notifications at the right time is hit and miss, and when using the Runkeeper app with the watch as a controller we encountered all sorts of bizarre problems, such as split times being read out twice and at irregular intervals. Unlike most devices, the specs under the hood of smartwatches don't matter that much. There's little need for stacks of processing power and overall the Moto 360 feels sharp, spritely and responsive. That said, the hardware line-up on the Moto 360 is a particularly average affair, with middle-of-the-road specs in every department, in comparison to its competitors. The 1.5-inch LCD screen has a resolution 320 x 320 at 205 pixels per inch (PPI), and it's certainly not the sharpest screen. That's borne out by the specs, with the Samsung Gear S coming in at over 300PPI. Powering this circular smartwatch is a Texas Instruments OMAP 3 processor, which is a throwback from smartphones four years ago. It's far from the latest tech, with most watches opting for Qualcomm Snapdragon, but it does the job adequately. There's no slowdown or lag, although if Motorola had opted for a more up-to-date processor, they could have unlocked better battery life. There's also 512MB of RAM, 4GB of storage, both absolutely standard across smartwatches. Battery life is all important in the wearable world, and everyone has different opinions on how long their device should last. At Wareable we'd love to see smartwatches last a week, like the Pebble, but when dealing with full colour LCD and OLED displays, that's not really viable right now. The compromise we'd say is that our devices should last comfortably all day, and the Moto 360 can do that – as long as you don't turn on the ambient light sensor. Typically, we'd return home after a busy day around town with about 40% of our battery remaining, and that included tracking an hour of running. Not too shabby. However, when we turned on the ambient light sensor which results in the display being illuminated far more regularly, it wouldn't even last 12 hours. As we've already said, the ambient light sensor is a good innovation ­– but we found the screen to be constantly needlessly illuminated, and it didn't do its job effectively, blinding our friends in the pub at regular intervals. Just disable the feature, and you've got yourself unspectacular but usable battery life. The Moto uses a wireless cradle to charge, which is a nice, easy and simple method of juicing up, however slightly inconvenient to pack for a weekend away. If you're packing light that might mean your Moto 360 stays at home, which will mean regular travellers will want to think hard about whether this watch is for them. The Moto 360 comes in at £199, but we'd encourage anyone serious about buying to invest in a decent strap, which will really ramp up the style. In terms of value for money, it's actually pretty strong. In terms of its competitors it's on a par with the Gear Live and the Asus ZenWatch, and we think it looks a lot better. It's important to remember that the Moto 360 lives in the very bottom of the traditional watch price band, and for similar money you could splash out on a mass produced quartz wristwatch with a limited lifespan, or perhaps the Swatch Sistem 51, which is the lowest priced mechanical watch on the market. Which will bring you the most joy? Well, that's for you to decide. The Moto 360 is the best Android Wear device we've seen, but there's still much to be improved. The watch itself will no doubt undergo serious refinement, so jumping in now will likely lead to disappointment – first from the technically superior LG G Watch R, and then from the next Moto 360, which we're sure won't be far behind. 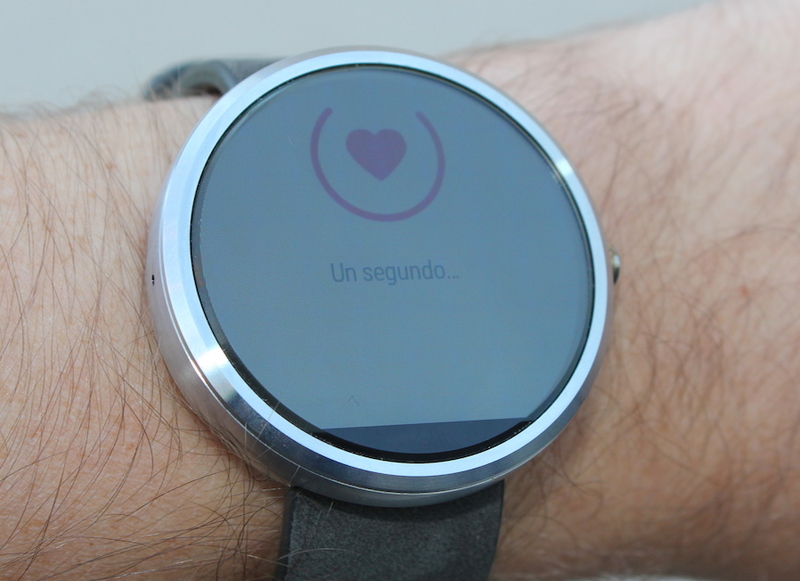 However, from our time wearing the Moto 360 we felt a change in our emotions towards smartwatches. It suddenly occurred to us that it doesn't matter if your smartwatch can't replace your phone or deliver life-changing features beyond our wildest imaginations. If it looks good and works well, smartwatches can indeed cut the mustard. 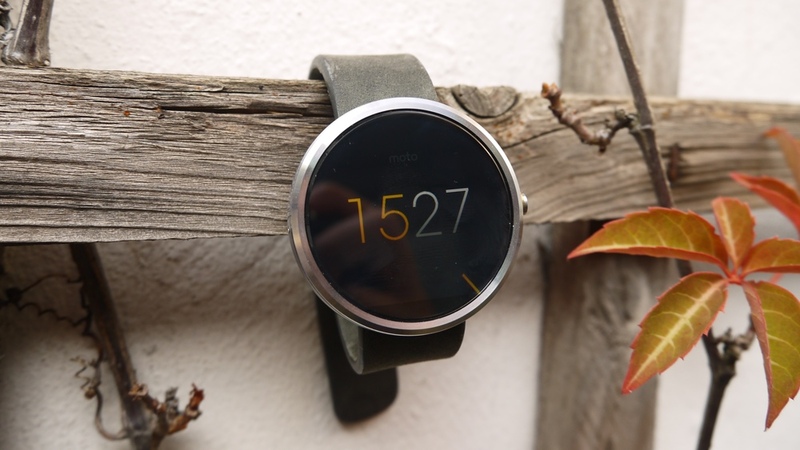 The best Android Wear watch we've seen so far, the Moto 360 will turn heads with its unique design and sleek looks. While it earns the right to be considered a real wrist watch, the chunky build and dated screen tech means that canny buyers might want to wait until the LG G Watch R or the Moto 360 2, whenever that might be.